Using chemicals during the cleaning process in an animal care facility can be high risk or even fatal for vulnerable or newborn animals. Using a chemical-free, high temperature steam cleaning process will ensure that your environment will be bacteria and outbreak free, as well as protect animals from chemical exposure. 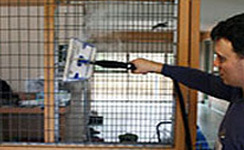 Using our steam cleaning equipment, you can ensure cage, floors, walls and operating theatres are sanitised and prevent cross contamination between sick animals. Our Duplex chemical-free floorscrubbers and steam cleaning machines allow facilities to use up to 90 per cent less water than traditional cleaning methods as well as save hundreds on chemicals costs. Hundreds of vets, kennels, lost dogs homes and more around Australia use our duplex floorscrubbers and steam cleaning equipment for all their cleaning needs. 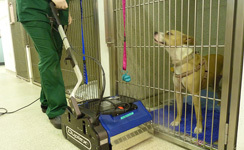 For more information about our animal care cleaning equipment, visit one of the links below.